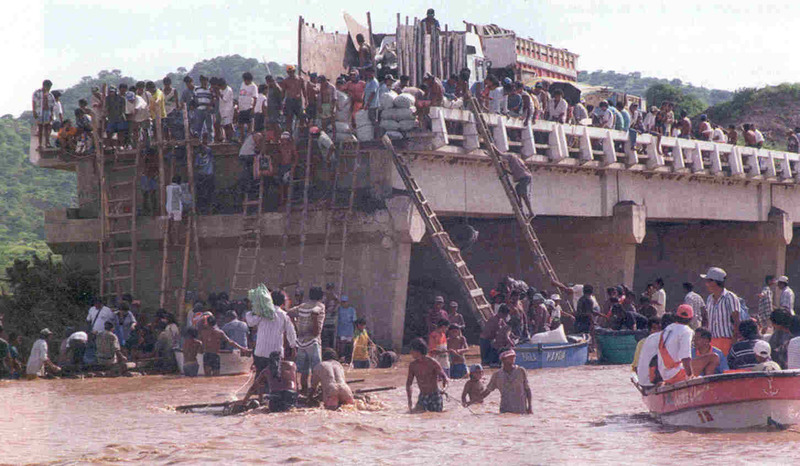 Worldwide experience shows that bridges over water streams mostly fail for hydraulic related reasons, and Peru is no exception. 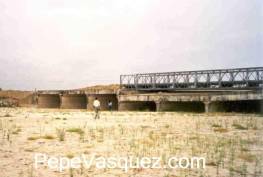 In 1998, El Niño was responsible for damaging or destroying a total of 68 bridges and about 800 km of roads, with an estimated cost of about US$ 600 million. Not even a war could cause such devastation to the road infrastructure. 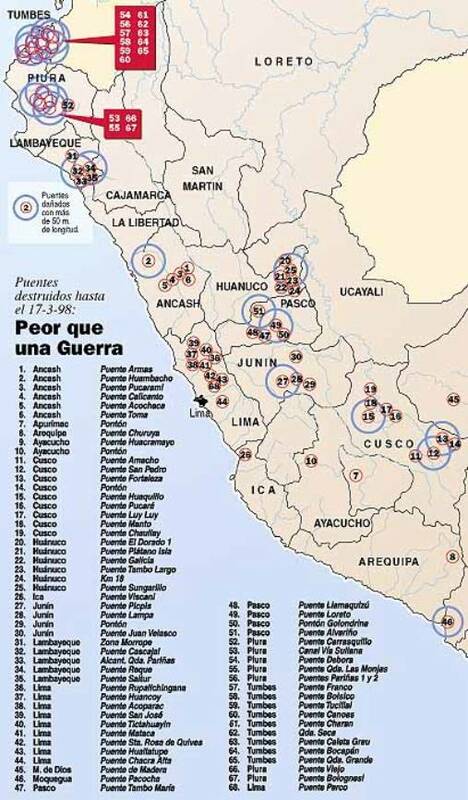 The picture on the right shows the locations of the failed bridges: blue circles represent bridges longer than 50 m. Northern Peru, especially the departments of Tumbes, Piura and Lambayeque, suffered the most failures. 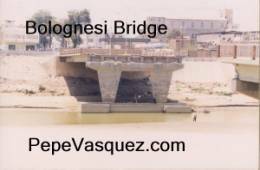 Bridges and culverts fail because of general and local scour. 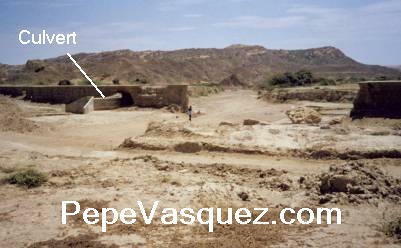 Bridge and culvert embankments fail as well, because of scouring and overflow. 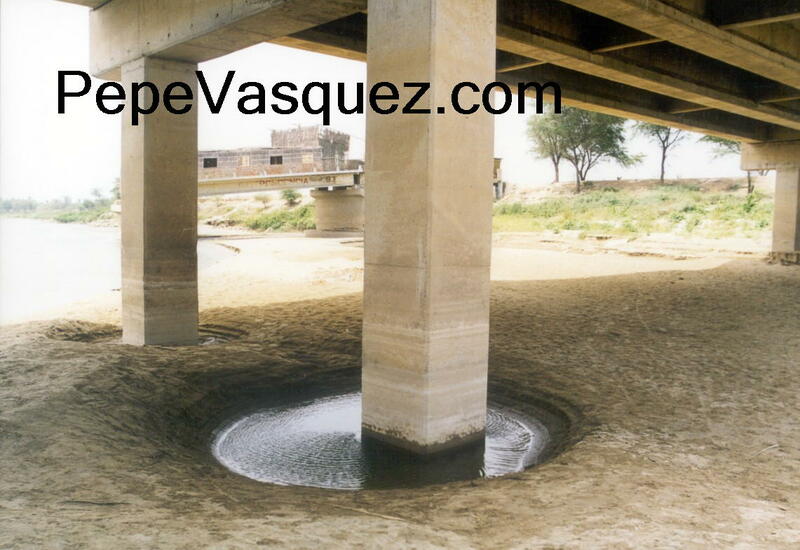 General scour or bed degradation is the riverbed lowering caused by floods. It can be temporal (i.e. the bed recovers its initial elevation) or permanent. 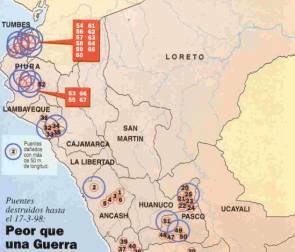 General scour is a natural phenomenon, but it can be aggravated by human intervention (e.g. dykes, floodplain elimination, meander cutoffs, aggregate mining). If intense, general scour can expose the foundation of bridges and other structures, leaving them most exposed to local scour. 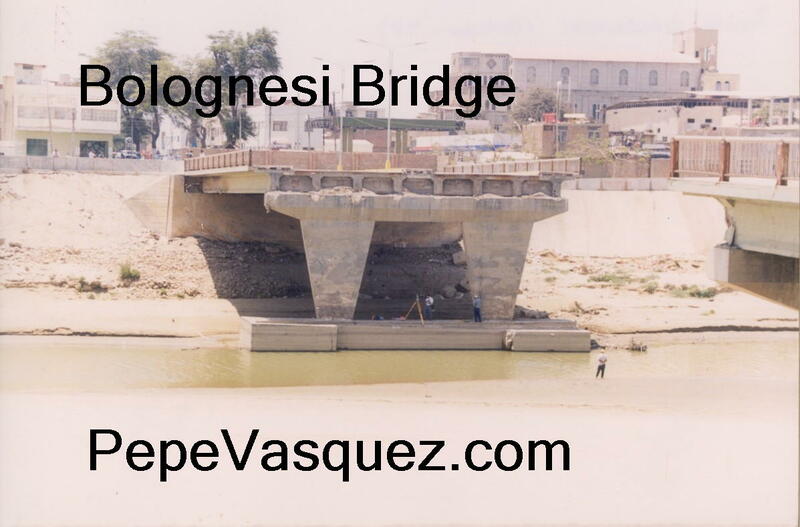 The picture on the right shows Perales Bridge in Spain, the piles and pile cap were exposed by permanent degradation. 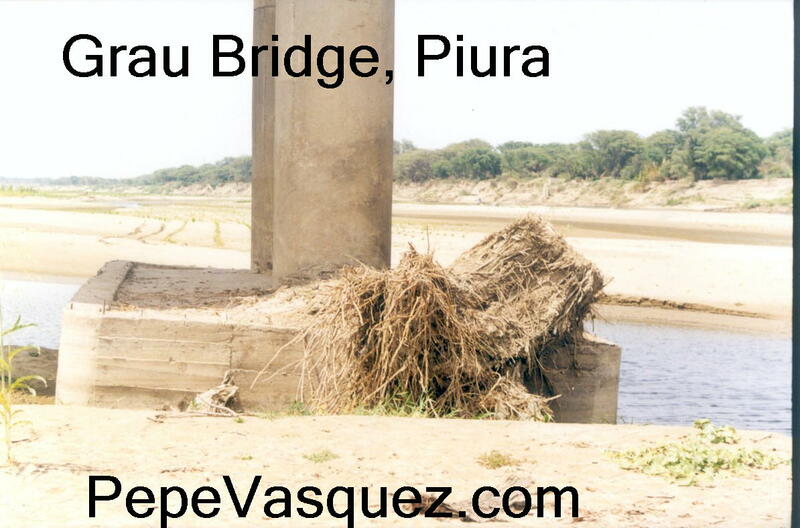 Many Peruvian rivers suffered from strong degradation. 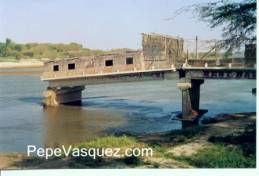 Piura River exhibits now a permanent degradation of about 4 m. That degradation exposed the foundation of many bridges, two of them in Piura City collapsed (Viejo and Bolognesi). 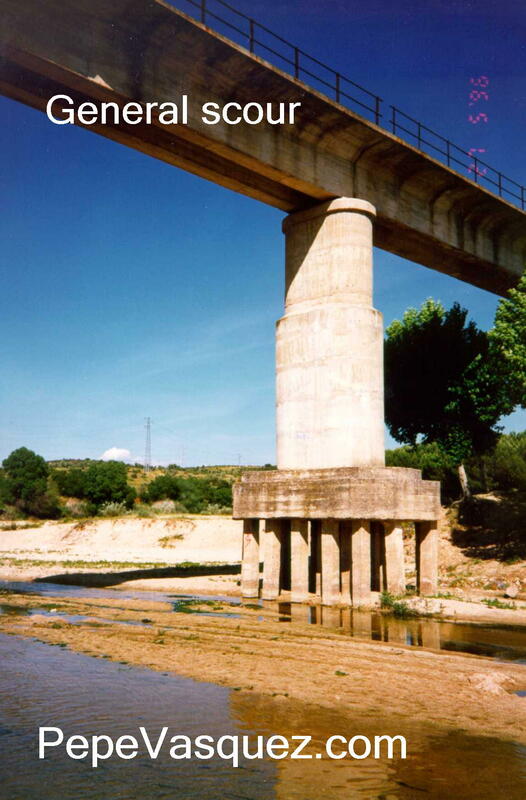 Contraction scour happens when the abutments or embankments of a bridge reduce the cross sectional area of a river. The contraction generates higher velocities and eddies increasing the scouring capacity of the flow. 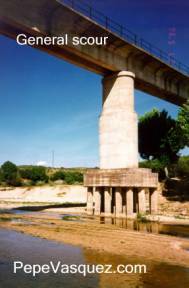 Bridge contractions are common practice in rivers with wide floodplains. The picture below shows the scour hole produced in the contracted section of a sand flume. Below is the contraction and abutment scour computed by the CFD 3D model SSIIM. Notice the similarity between the scour hole shape in the experiment (above) and the numerical solution (below). 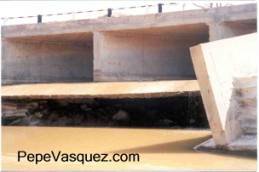 Notice that maximum scour depth happens in the upstream corner of the abutment. Local scour at piers is generated by eddies formed by the obstruction to flowing water made by the pier itself. The maximum scour depth depends on the flow velocity and depth, as well as pier width. 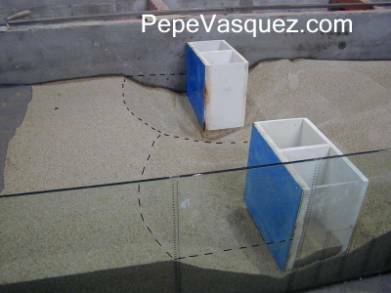 When general scour exposes a wide foundation, the "effective" width of the pier increases and so does the scour depth. Hence, general scour may have the effect of increasing local scour. Local Pier scour: (a) Notice scour hole at the New Independencia Bridge on Piura River (b) sunk pier at the Old Independencia Bridge that failed in 1983. 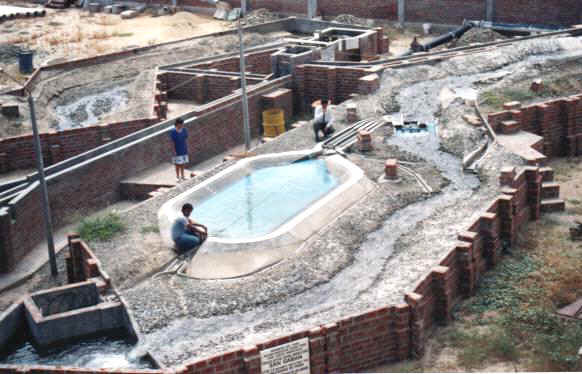 Until very recently, physical modeling was the only available technique to study local scour. Nowadays, CFD models can perform that task with very promising results, as shown below for a scour hole computed using SSIIM (Georg Premstaller, 2001). 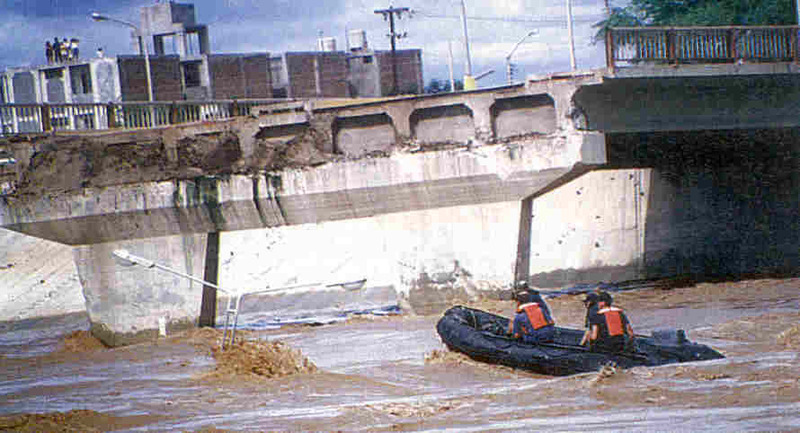 In many cases the embankment that links the bridge or culvert to the riverbanks fails, even when the bridge or culvert remains intact. Although this failure seems less catastrophic, traffic flow is interrupted anyway, generating distress and isolation of communities . 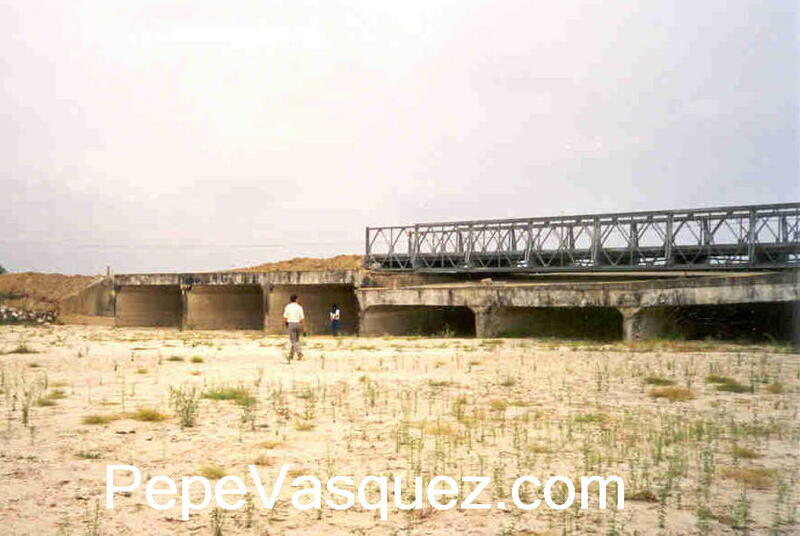 Wide multiple box culverts are common in Northern Peru, as a cheap alternative to long bridges. 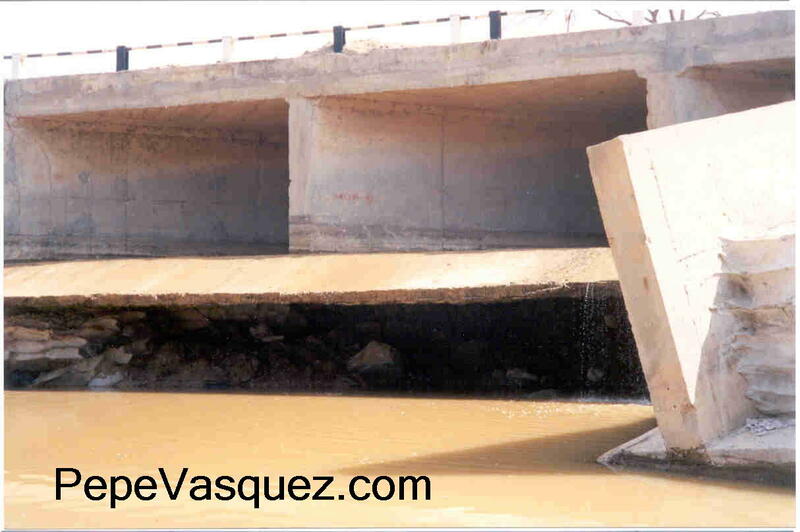 Their main problem is that bed degradation lowers bed elevation downstream of the culvert (see picture below, left) producing a "fall", which may trigger the occurrence of an erosive hydraulic jump. The local scour generated by the hydraulic jump downstream of the culvert may cause the culvert downstream end to "sink" (see picture below, right).